Considered to be the most complete marsupial genome sequenced to date, it is in terms of quality, on par with the human genome. The highly accurate genomic data will provide scientists with new information that will inform conservation efforts, aid in the treatment of diseases, and help to ensure the koala's long-term survival. "The Koala Genome Consortium has been an ambitious journey affording us great insights into the genetic building blocks that make up a koala—one of Australia's, as well as the world's, most charismatic and iconic mammals," Professor Johnson said. "This milestone has come from our vision to use genomics to conserve this species. The genetic blueprint has not only unearthed a wealth of data regarding the koalas unusual and highly specialised diet of eucalyptus leaves, but also provides important insights into their immune system, population diversity and the evolution of koalas," she said. "The genome provides a springboard for the conservation of this biologically unique species." The Australian led consortium of scientists comprised 54 scientists from 29 different institutions across seven countries. They have sequenced over 3.4 billion base pairs and more than 26,000 genes in the Koala genome—which makes it slightly larger than the human genome. Unlocking the genomic sequence gives scientists unprecedented insights into the unique biology of the koala. "The genome enables a holistic and scientifically grounded approach to koala conservation," she said. "Australia has the highest mammal extinction record of any country during the Anthropocene. "Koala numbers have plummeted in northern parts of its range since European settlement, but have increased in some southern parts, notably in Victoria and South Australia." "Today we celebrate the completion of the highest quality, marsupial genome sequencing undertaken to date. This work was brought about through the meticulous efforts not only of Professor Johnson and Professor Belov, but also the contributions from many other Australian Museum scientists, as well as scientists from around the nation and the world. It will usher in a new era in our understanding and conservation of the iconic koala," she said. Professor Jennifer Graves, AO, Distinguished Professor of Genetics, La Trobe University and winner of the 2017 PM's Prize for Science, said: "We could never have imagined, when we were pioneering koala genetics in the 1980s, that one day we'd have the entire koala genome sequence. This opens up all sorts of ways we can monitor the genetic health of koala populations." 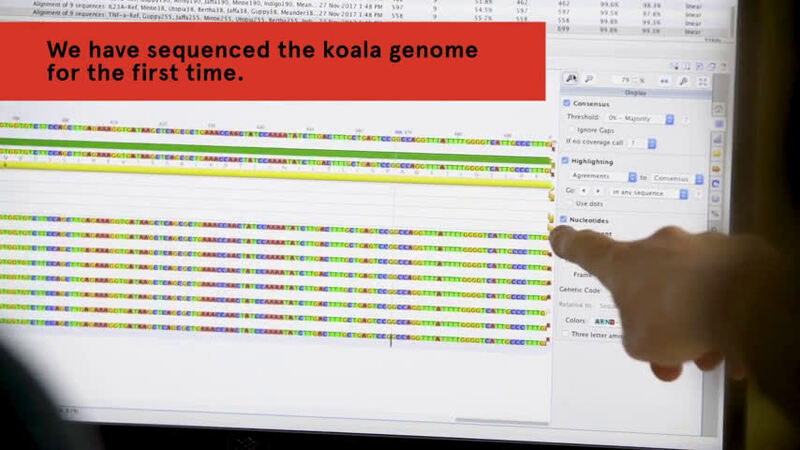 The Koala Genome Consortium announced the establishment of the project in 2013 with its first unassembled draft genome. The collective aim was to steer their research towards ensuring the long-term survival of this important marsupial while simultaneously increasing Australia's genomics capability. "We then assembled the genome with supercomputers, allowing the Consortium to then study the >20,000 genes of this unique species," said Professor Marc Wilkins, Director, Ramaciotti Centre for Genomics, UNSW. As Professor Johnson explains, "this probably helped them to find their niche to survive, as they could rely on a food source that would have less competition from other species who were not able to detoxify as effectively." Dr. Will Nash in the Haerty Group at Earlham Institute, said: "Gene duplication can lead to copies of genes associated with specific functions being retained in the genome. In the Koala, the largest group of retained copies make an enzyme that breaks down toxins. This means the Koala has evolved an excellent toolkit to deal with eating highly toxic eucalypts, one made up of lots of copies of the same (or very similar) tools." "We characterised the main components of the mothers' milk—which is crucial for koala joeys—born the size of a kidney bean and weighing half of one gram," Professor Belov said. "We identified genes that allow the koala to finetune milk protein composition across the stages of lactation, to meet the changing needs of their young." "Thanks to the high-quality genome, the team was able to analyse and discover koala-specific milk proteins that are critical for various stages of development. 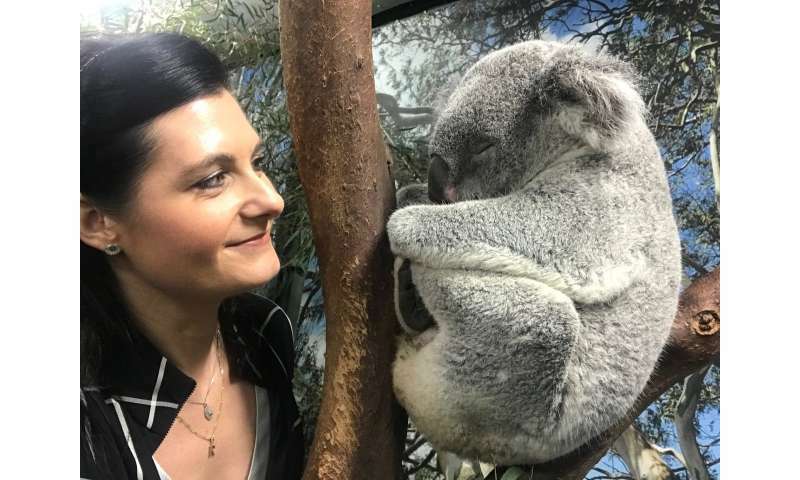 It also appears these proteins may have an antimicrobial role, showing activity against a range of bacterial and fungal species, including Chlamydia pecorum, the strain known to cause ocular and reproductive disease in koalas," she said. Professor Peter Timms, University of the Sunshine Coast said: "In addition to Chlamydia, the other major infection that is threatening the species is koala retrovirus (KoRV), however very little is presently known about it. The complete koala genome has been instrumental in showing that an individual koala can have many (more than a hundred) insertions of KoRV into its genome, including many versions of KoRV. "This information will enable to determine which strains of KoRV are more dangerous and to assist with our development of a KoRV vaccine," he said. Professor Johnson added: "For the first time, using over 1000 genome linked markers, we are able to show that NSW and QLD populations show significant levels of genetic diversity and long-term connectivity across regions. "Ensuring this genetic diversity is conserved in concert with other conservation measures to protect habitat, reduce vehicle strikes, dog attacks and disease, are the keys to the long-term survival of the koala." Dr. Graham Etherington in the Di Palma Group at the Earlham Institute, said: "With its puppy-dog looks, the Koala is an internationally recognised species. But this iconic Australian marsupial is not just a pretty face. "The Koala genome assembly is by far the most comprehensive marsupial genomic resource to date, which allows us an insight into how this unique animal came to be and provides us with information about potential threats to its survival. It also provides us with an excellent platform to launch further marsupial genome projects that could look into potential genetic reservoirs of previously unknown anti-microbial genes that could be leveraged for human health. "Additionally, it provides us with an incredible amount of information about genetic diversity across different populations of koalas that can be used as a benchmark for further studies on other endangered marsupial species." "Not only does open data promote the best interests of science, it also maximises the benefits that the koala populations, and the public, receive from such research," Professor Johnson said. The koala (Phascolarctos cinereus) is a native tree-dwelling Australian marsupial that is one of the world's most fascinating and iconic mammals. Not only is the koala synonymous with Australia it is also a powerful international symbol for the preservation and conservation of our natural world. Their unique and highly specific diet of eucalyptus (gum) tree leaves, has resulted in koalas being especially vulnerable to habitat loss due to the clearing of native vegetation for agriculture and urban development. The Australian Federal government lists koala populations in Queensland, New South Wales and Australian Capital Territory as 'Vulnerable' under national environment law. "Our next efforts must be in the application of these findings to genetically manage koala populations, advance the treatment of the diseases affecting koalas, with the goal of conserving this very important species," Professor Johnson said.